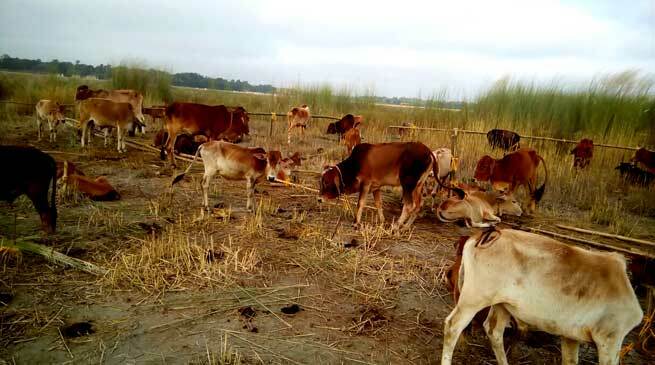 Troops of Border Security Force ( BSF ) deployed under Guwahati Frontier in Dhubri Distt, (Assam), Falakata and Cooch Behar Distt, of (West Bengal) have seized huge numbers of cattle heads meant for smuggling to Bangladesh on the intervening night of 16th & 17th Sept 2016. 418 cattle heads, worth approximately Rs. 15,88,468/- were seized from the Indo-Bangladesh border in Dhubri and Cooch Behar. The seized cattle were deposited with concerned Customs authorities for further disposal. In the past 15 days BSF has been able to seize 4537 cattle heads having worth Rs. 2,60,76,140/- and have apprehended 13 Indian criminals.